Public health activity, and the state’s public health responsibilities to assure the conditions in which people can be healthy, can only be achieved through different means of social coordination. This places law and regulation at the heart of public health. They are fundamental both to methods of achieving public health goals and to constraints that may be put on public health activity. As such, trainees, practitioners, and leaders in public health need to understand the breadth and nature of wide-ranging legal and regulatory approaches and the place of ethics in public health. Public Health Law, written by three leading scholars in the field, defines and examines this crucial area of study and practice. It advances an agenda whose scope extends far beyond that covered in traditional medical law and health care law texts. The authors provide an account of the scale of contemporary public health policy and practice and explain its philosophical depths and implications and its long legislative and regulatory history. They advance a definition of the field and explore how different legal approaches may serve and advance or constrain and delimit public health agendas. 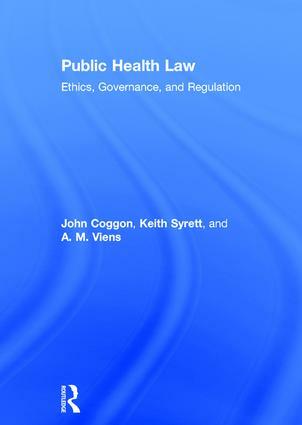 This ground-breaking book presents the field of public health ethics and law and goes on to examine the impact within the UK of private law, criminal law, public law, EU and international law, and ‘softer’ regulatory approaches. It is a primary point of reference for scholars, practitioners, and leaders working in public health, particularly those with an interest in law, policy, and ethics. John Coggon is Professor of Law at Bristol University, UK, and an Honorary Member of the UK’s Faculty of Public Health. Keith Syrett is Professor of Public Health Law at Cardiff University, UK. A. M. Viens is Associate Professor in Law at the University of Southampton, UK.